Hot Black has designed the offices for non-profit Vision Australia, located in Melbourne, Australia. 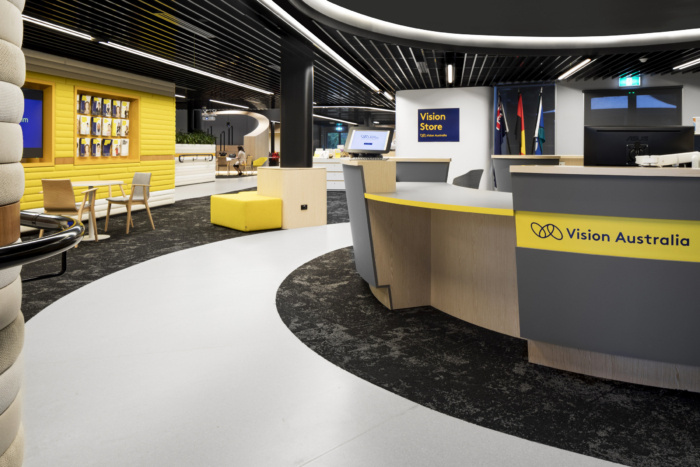 After years of planning and coordination, stage 1 of Vision Australia’s Melbourne Office has been completed. With a workforce made up of 240 visually impaired employees, Hot Black had the unique opportunity to create something that was not only aesthetically beautiful, but practical too. Hot Black’s Architectural, Interiors and Graphics team had to develop an intricate understanding of sensory design and innovation, taking into consideration contrasting colours, curved detailing and wayfinding solutions. Our designers undertook immersion sessions with Vision Australia to appreciate what it is like to be visually impaired, and to help understand design problems that needed to be overcome. Sharp edges created a safety hazard, similar colours were hard to visually differentiate and tactile surface became a priority. With both staff and the public using this building, Hot Black ensured the space was innovative, practical and stayed true to Vision Australia’s core values.